Bramley is a Saxon name meaning a clearing in the broom. Birtley to the south is also Saxon and means a clearing in the birch. The wider area had been settled before the Saxons arrived. The builders of the Iron Age fort at Hascombe (in use from c.200 to 50BC) probably included farmers from the Wintershall and Thorncombe Street areas of present day Bramley, but there is no evidence for early settlement in the village area and no evidence of any Roman settlement. The Anglo-Saxon settlers of Wonersh - the name means a crooked field - may have been the people who developed the Linish Bramley. This name means a flax-stubble field and in 1843, when the Tithe Assessment map was drawn, it covered the area now occupied by the Library, Blunden Court and Old Rectory Close. Flax was used to make linen but before spinning and weaving the stems were "retted"; this meant soaking them in running water, a procedure which could have used the stream which also powered the mills. There were two mills - probably both here at the time of Domesday - Bramley Mill and Snowdenham Mill to the latter of which Emply Lane (now a bridleway) led from the higher land around Wintershall. At the time of Domesday (1086) the Manor of Bramley was far larger than present day Bramley and comprised most of the western half of Blackheath Hundred, extending to the Sussex border and including Shalford, Wonersh, Hascombe and West Cranleigh. Coronation Oak green today is all that remains of the original village green at the centre of the village. It was once the crossroads where Linersh-lane, the road from Wonersh, met Deep Lane, the original route from Wintershall, and the first Mill Lane (moved in the 1820's), which started from the north side of the house now called 'Saddlers', which was previously known as 'Corners' or 'Old Corners'. There is a reference to a moated manor house near the village green, which would probably have dated from the 1300's; it survived to the early 1800's. At some date during the Middle Ages the road from the village to Birtley around the east slope of Hurst Hill was established, as was the road from Thorncombe Street to Bramley and Wonersh (later to be Snowdenham Lane and Station Road). Bramley Church, dedicated to the Holy Trinity, was probably first built in the 1100's. The Tower and Chancel date from the early 1200's with the south transept (now part of the south aisle) added later in the century. It was not until 1676 that boundary walls were built and the burial ground was licensed. Holy Trinity was a daughter church of Shalford; Bramley only became a separate parish in 1847. By the mid 16th century there were 63 houses in what was called Bramley township, 22 of them within half a mile of the church. The most important house in the village was probably the present East Manor; its external staircase was added in the 1580's, when it would have been seen from the village green, demonstrating the importance of the owners at a time when domestic staircases were still rare. The village would have been growing in the 17th century - many of the houses on the west side of the High Street date from this period. Bramley Manor, opposite East Manor and originally the farm for Bramley Manor, was built in the middle of this century. The 18th century brought more changes with the road through the village b ecoming part of the Turnpike road from Guildford to Arundel, following an Act of Parliament of 1757; there is still a milestone in Birtley Road. A bridge and causeway were built on the road to Wonersh in the 1770's; the river was then diverted from its original course close to the bottom of Wonersh Hollow into a new straight course to align with the new bridge. Most villagers would have made their living from agriculture, but for the poor the Parish purchased a house called the Nunnery in 1735. This was at the far end of the Bramley millpond; it was sold a century later when the poor had to go to Hambledon Workhouse. More happily, by the early years of the century the Jolly Farmer was established. The Napoleonic War brought concerns for shipping in the Channel and plans to create an overland connection between London and Portsmouth led to the building of a canal to connect the rivers Wey and Arun. This finally opened in 1816. James Stanton was appointed Superintendent of the canal in 1819; by the time of his death in 1857 he had five barges of his own, but by now use of the canal was declining and it finally closed in 1871. Stanton's cottage on the wharf still survives. In 1825 the Earl of Egremont, a great supporter of the canal, had purchased a property in Bramley on the site of the present Park Drive which was soon demolished. He diverted some of the water from the millpond to the canal in an attempt to improve the canal's water supply; this had a lasting effect as the watercourse would define the boundary between the later school and cemetery. The Earl of Egremont also moved the lane to the mill, roughly to the present Park Drive, and his nephew built Bramley House, now almost completely demolished. This house was later leased by Captain Jekyll and was the childhood home of Gertrude. After the Jekyll family left in 1868 the house was considerably extended and the lane to the mill now became a driveway to the house with a third Mill Lane (the present one) put through in 1871. Development in the village was also influenced by Mrs Charlotte Sutherland, who leased Church House in 1848. She largely financed the building of the north aisle of the Church in 1851, the new Vicarage (now demolished and replaced by Old Rectory Close), the Village School, the cemetery and its chapel (also demolished); her brother, Richard Charles Hussey, was the architect for all these developments. Charles Smith purchased a site from Elizabeth Street of Birtley House in 1848. Here his son William established a brewery before 1865. This continued in operation until 1923, when the brewery chimney was demolished. His other son Richard established a foundry which lasted until the early 1960's; it is now the site of Bramley Motors. By the mid 19th century the village had a population of around 850 most of whom would have worked in the village, mainly in agriculture. Various railway companies had built lines in the vicinity and there were stations at Guildford in 1845, Godalming soon after, and Shalf ord in 1849. 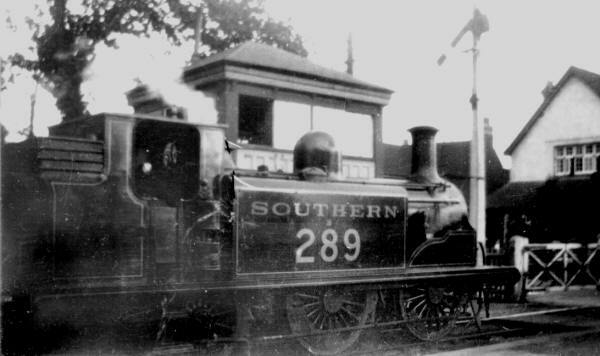 Then in 1865 the line between Guildford and Horsham was opened and Bramley (and Wonersh) had its own station. This was perhaps the main reason for the increase in population that followed, and there were housing developments including Station Road, Birtley Road and Eastwood Road; the south aisle, incorporating the south transept, was added to the Church in 1875. There were several shops in the village by the 1850's but at the end of the century William Lawn Head re-fronted several of the houses on the west side of the High Street to provide Head's Stores. The Stores have since been split into a number of individual premises but Head's elegant shop-fronts remain. St. Catherine's School was established in 1885, and has grown to have a significant physical presence in the village. Building of the Chapel began in 1893 and it was dedicated in the following year. It is a notable example of the work of Charles Eamer Kempe, who was responsible for much of the interior decoration, especially the stained glass windows. By the end of the 19th century the local government of the village changed with the establishment of a Parish Council in 1894. This met, as it still does, in the Village Hall whose Victorian exterior and modern additions conceal a barn with timbers dating back to c.1400. Gertrude Jekyll, who had spent her childhood in Bramley, retained an interest in the area, and her friend Edwin Lutyens designed Millmead House in Snowdenham Lane as a speculative development for her in 1904; she, of course, designed the garden. Grange Cottages were also built at the beginning of the century as staff cottages for Bramley Grange. The Great War brought tragedy to the village with many of the young men killed. Wounded men from the front were also seen in the village as Thorncombe Park was used as a hospital. In 1921 the war memorial at the crossroads was built, designed by architect and local resident Frederick Hodgson. In 1887 Bramley Grange was built on the site of the earlier White House for Colonel Webster (who would later develop Bramley Golf course). After the Great War it was converted to a popular hotel and remained a hotel until burnt down in 1996. Between the wars there was more housing development, including the start of Linersh Wood. The railway closed in 1965 after serving the village for almost a century. The Bramley Grange Hotel has been replaced in 2004 by flats built in a similar style. To mark the year 2000 the Bramley History Society organised the photographing of nearly all the buildings in the parish to provide a record of an ever-changing scene.